Charters of Freedom Monuments are being placed across the United States by Foundation Forward, Inc. The foundation’s goal is to provide educational resources to children and citizens in the communities in which Charters of Freedom have been placed. The idea that evolved into Foundation Forward began on May 3, 2012 while Vance and Mary Jo Patterson were attending the National Day of Prayer meeting being held at the on the Old Burke County Courthouse Green in Morganton. The idea came to Mr. Patterson to try and duplicate his experiences when he and his wife had viewed the Declaration of Independence, Constitution and Bill of Rights on a visit to the National Archives. He determined to bring that experience to the citizens of Burke County. The first monument was dedicated on July 2, 2014 at the Old Burke County Courthouse. Several dozen additional monuments have since been placed or are planned across North Carolina and in at least nine other states. Among already dedicated Charters of Freedom monuments are memorial complexes in Burke and Cherokee counties. The memorial is located near the intersection of College Street (U.S. 74) and Court House Plaza on the right when traveling east on College Street. It stands on Roger McGuire Green, at the northeast corner of the Pack Square Park next to the Western North Carolina Veterans Memorial. 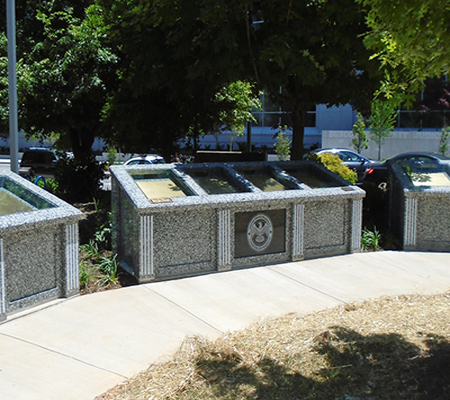 In the immediate area of the old Buncombe County Courthouse there are other notable plaques, monuments and memorials: 60th North Carolina Regiment, Revolutionary War, Spanish American and other wars, Police and Firemen who died in the line of duty, Medal of Honor recipient Lt. Colonel Robert Morgan and former Governor Samuel Ashe for whom Asheville was named. Several hundred yards to the west stands the monument to Zebulon Vance and several other small markers.